There were a few surprising omissions in this years Oscar Foreign Language shortlist, most notably Korea's Mother (Magnolia, 3/12) and Denmark's fantastic Terribly Happy (Oscilloscope, 2/5), but the major players (i.e. A Prophet and The White Ribbon) are here. The other finalists are a mixed bag. And while I still think it comes down to A Prophet vs. The White Ribbon, they both need to be wary of The Netherlands' Winter in Wartime. 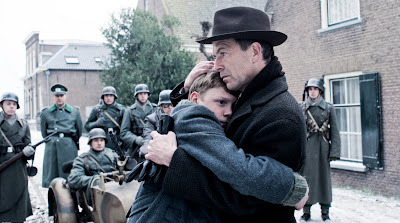 While it has yet to pick up a US distributor, Winter in Wartime is a beautifully shot, if ultimately pretty basic, WWII drama about a young boy in occupied Holland who discovers a downed British fighter pilot in the woods, and secretly cares for him. This is this kind of thing the Academy will eat up, especially older voters, who tend to be the ones who vote in the Foreign Language category, since all five nominated films must be seen in special, AMPAS approved screenings. Last year we saw Japan's schmaltzy Departures come out of nowhere to upset frontrunners The Class and Waltz with Bashir, could Winter in Wartime be this year's spoiler? It's not as blatantly sentimental as Departures, but it has Nazis, which is always a plus. It's basically a coming of age drama set against the backdrop of WWII, which has Oscar written all over it. As much as I love The White Ribbon (I'm pulling for it to win), I still think it may just be too bleak for the blue hairs, and A Prophet isn't exactly a walk in the park either. I'm not going to bet against the front runners right now, all I'm saying is they need to watch out. I thought "Winter in wartime" was a spoiler too until I saw "The World is Big and Salvation...", now that's something they'll eat up and think they're being so cool and forward-thinking when they vote for it. Both choices make me weep though, especially when Haneke's film is SO good. I agree, THE WORLD IS BIG is a tearjerker, which will play well. But I really love THE WORLD IS BIG, and I kind of don't want it to have the negative connotation of having been the Oscar spoiler. Doesn't really matter though. It's Haneke's to lose.